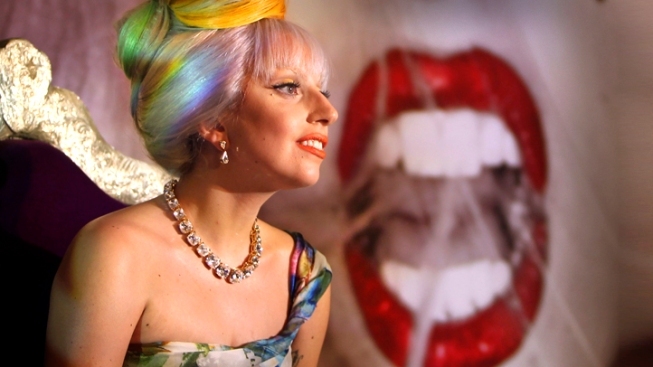 Lady Gaga was in India Oct. 28 in a surprisingly classy one-shouldered dress, drop earrings, and technicolor hair. Click through to see more of Mama Monster's outrageous style. Much of America was going gaga over 176 Stanton Street in the Lower East Side on Manhattan last January when Stefani Germanotta aka Lady Gaga took 60 Minutes on a tour during a visit to her pre-fame haunts. Now, the very one-bedroom crib where Lady Gaga lived before she wowed the world with her eccentric style and sweet tunes is up for grabs to any little monster with $1,850 per month to burn. Located in a nondescript tenement building, Lady Gaga's former home includes one bedroom, one bathroom and a tiny but very appropriate to Manhattan-sized kitchen. The singer reportedly lived at this very apartment before hitting it big time, which the listing is apparently capitalizing on. It reads: Former abode of the infamous Lady Gaga--legitimately! Unfortunately for Lady Gaga fans, the star didn't leave any notable mark on the place. In fact, Jezebel remarks, "she didn't leave any freak art on the walls, but it still looks like a nice place."